The new baby in Behringer's Truth monitor range offers great value for money and sleek good looks. Behringer have updated their Truth monitor range to offer two models, the B2030A reviewed here and the larger B2031A. Both are ported, active two-way nearfield systems, the main difference being that the B2031A has an 8.75-inch bass/mid-range driver and a one-inch tweeter, while the B2030A has a 6.75-inch bass/mid-range driver teamed with a 0.75-inch tweeter. In both instances the speakers are built symmetrically, so there's no need for separate left-hand and right-hand speakers. As you'd expect, the larger monitors have more firepower in the amplifier department (150W and 75W) and generate a slightly greater Sound Pressure Level (SPL). The B2030A has a 75W amplifier driving the bass/mid-range unit plus 35W powering the ferrofluid-cooled, soft-domed tweeter. Like the earlier Truths, both drivers are set into a moulded baffle trim that incorporates a tweeter waveguide to control directivity, and both drivers are magnetically shielded for use near TV monitors or the few antiquated glass CRT computer screens not currently awaiting disposal at a car-boot sale. Clearly the speakers are built to a price and are economically constructed from plastic-laminated E1 MDF, though this is actually a good cabinet material because of its density and self-damping properties. You might not get natural cherry-wood veneer, but the overall impression is smart. The long-throw bass/mid-range driver features a polypropylene cone with roll surround mounted in a cast aluminium chassis. The port exits comprise separate slot-shaped moulded inserts set into the baffle on either side of the tweeter. The active crossover, which is set at 2kHz, utilises fourth-order (24dB/octave) Linkwitz-Riley filters, and the speakers are also designed to be used with or without an optional subwoofer, though they manage a perfectly decent low end without one. Separate high- and low-frequency limiters look after the self-preservation interests of the drivers, and there's an automatic standby mode that puts the amplifiers into sleep mode if the speakers aren't used for more than five minutes. They wake up almost instantly on receipt of an audio signal. 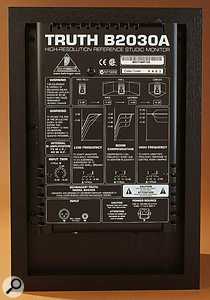 Photo: Mike CameronAt the rear of the cabinet, which measures 12.5 x 8.4 x 8.33 inches, is a choice of XLR or TRS jack servo-balanced inputs, plus an IEC mains connector and a power switch. These are all mounted on the amp chassis, with the mains and input connectors on the underside. An LED set into the front-panel baffle surround comes on when the speakers are powered up, and a second LED indicates that the limiter threshold has been reached. An input gain trim control allows level adjustment from -6dB to +6dB, and there are slide switches to adjust the frequency characteristics of the speaker to suit different environments. At the low end, the response can be flat, -2dB, -4dB, or -6dB, which the manual tells us is to accommodate an optional subwoofer or to simulate the response of smaller speakers. A further switch compensates the low end to take account of room placement, and this again offers flat, -2dB, -4dB, or -6dB options. Normally bass attenuation is only needed if the speakers are located close to a wall or corner, as the boundary effect causes a rise in bass energy, but it may also be useful to reduce the bass output slightly in smaller rooms. At the high end, the switch positions are +2dB, flat, -2dB, or -4dB to suit the HF reflectivity of the room in which the speakers are used. Unfortunately the manual doesn't give any details of what frequencies these filters are set at, so all adjustments must be made by ear. Although quite different in size, both models have ostensibly similar frequency responses extending from 50Hz to 21kHz. However, no decibel limits are given, so this means relatively little. The provided frequency-response plot is also an obviously 'smoothed' response curve, and so doesn't show up all the narrow humps and bumps that every speaker exhibits. Where size does matter is in sound level — the B2030As can generate up to 113dB per pair at one metre, while the larger B2031As manage an extra 3dB. In my own studio, with all the EQ switches set flat, my first impression was that the monitors sounded slightly brash, with less depth of bass than I expected. This situation improved noticeably when I dropped the tweeter level by 2dB, so it is important to adjust the EQ settings to match your room and monitor positions. 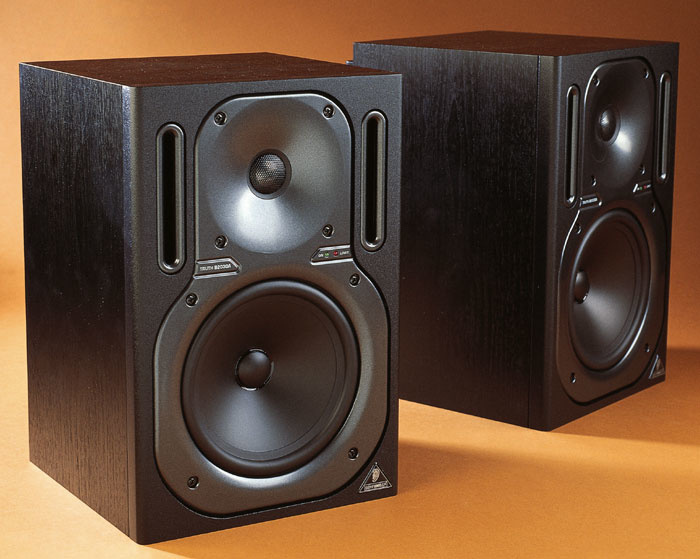 Once optimised, the speakers delivered a very decent level of performance given their budget price, though their shortcomings were still evident when they were tested alongside my Mackie HR824s. I found that the subjective depth of bass was less than I expected based on the technical spec, while the tweeter sounded slightly 'forward', but they still delivered a fairly good overall balance and proved capable of discriminating between good mixes and not-so-good mixes. Of slightly more concern to me is the way these monitors, and some other budget monitors I've tried, seem to filter out some of the more subtle elements of a mix, leaving the principal parts sounding rather exposed, not unlike listening to an MP3 and then comparing it with the original. The finer points of the reverb and the air between the instruments tend to be diminished, which reduces your ability to hear 'into' a mix, but you have to bear in mind that these comparisons are being made with much more expensive speakers. As low-cost speakers, they still perform rather better than you could reasonably expect for the price, and it shouldn't be hard to set up a decent mix balance using them. If you are on a very tight budget, then the B2030As offer very good value and they can be made to perform perfectly adequately in smaller rooms, provided that you take due care with their placement and experiment with the EQ switch settings. 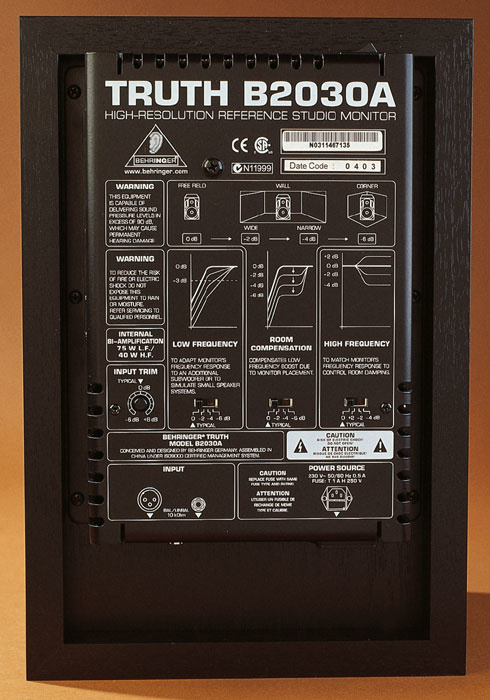 I think the designers have used their available manufacturing budget extremely well in producing a useful and good-looking monitor at such a low UK price point, though there's no denying that spending more money will buy you better performance and greater accuracy. With monitors you generally get what you pay for, but in this case it's probably fair to say that you get slightly more than you pay for! Although clearly aimed at the budget-limited home-recording enthusiast, the B2030As could also serve a valuable part in the more professional studio by acting as a secondary monitor for checking how mixes might translate to a domestic playback system. Finally, the B2030As are designed as nearfield monitors, and as such should be used fairly close to the listener, where they deliver plenty of level. If you feel you need more depth of bass and more level, then the B2031As may be a more suitable choice. Good value for those on a tight budget. Not as much bass as I'd hoped for. The sound's a little light on detail, but nothing to stop you setting up a decent mix balance. You generally get what you pay for when it comes to monitors, but these new monitors do seem to offer just a little bit more than you'd expect for the price. B2030A £234 per pair; B2031A £281 per pair. Prices include VAT. Behringer UK +49 2154 9206 6441.